Professor Alan Miller delivers his opinion on the numerous views of news satire hosts. Not many other classes out there get students fired up like JOUR 320: Race and Gender in the Media. The class not only covers controversial topics dealing with gender, ethnicity and social class, but professor Alan Miller likes to play devil’s advocate. Miller bounces ideas back and forth during class in order to show students how to look at subjects like racism and sexism in a different way. In one such instance, Miller has gone down his class roster and profiled all his students by both their race and gender to prove his point. Some students may take offense to some of the topics and humor that come up in the classroom, but Miller believes it’s needed to get students to speak their mind and to keep them engaged. 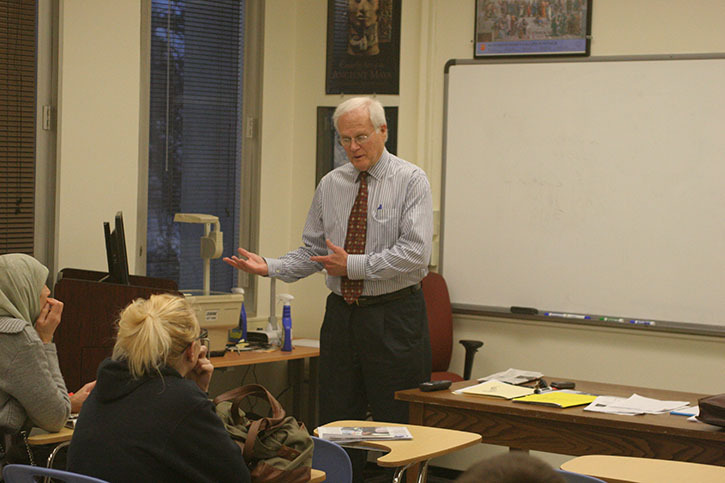 With a strong background in journalism and teaching, Miller aims to teach students to think for themselves and to have an open mind. “The main goal is to get students to shape their own informed opinion, and to not let the media or others make their decisions for them,” said Miller. Journalism major Faisal Manzoor said of the class, “This class is very lively and the length of the assignments are as long as you want them to be, as long as you have strong information. Mr. Miller is a great teacher as well. He keeps the lectures interesting and gets his point across”. Miller also brings a large amount of enthusiasm to class as well, so even the lecture portion of the class keeps students interested. “Sometimes students view me as a bigot for the things I say. I don’t believe most of the things I say, but it gets students to become passionate and engaged in the class and I find that to be a good thing,” said Miller. One portion of the class work has students do an assignment about late-night talk or news satire hosts, and have a discussion about the way their views are portrayed and the way they act within the eye of the media, as well as when they’re not in sight of the media. If you’re looking for assignments and discussions that will keep you amused, then this is the class for you. Miller makes sure all of his students are involved in class activity and discussions. 1 Comment on "Take This Class: JOUR 320: Race and Gender in the Media"
Curious how the teacher profiles white men, given that’s the default assumed trace and gender for most news in this country. Easy to profile minorities–they’re already othered by the sociopolitical institutions of our country–but how do you make white men self-conscious? Perhaps label them as predisposed to domestic terrorism/gun violence or racism/misogyny?